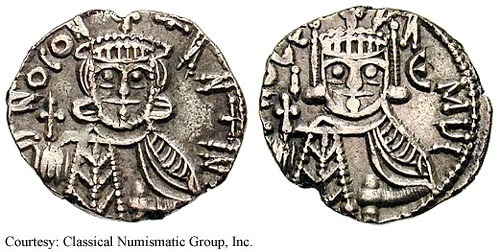 SB 1550, DOC II 1, BN 5 AU Solidus Obv: CONSTANTIN (NC) - crowned bust, holding cross potent and akakia. Rev: GL ONPAM L - Bust of Leo IV, as on obverse. 741-751 (Constantinople). $575 9/25/02. SB 1551, DOC II 2 AU Solidus Obv: Crowned bust of Leo III, wearing loros, holding cross potent on base. Rev: Crowned busts of Constantine and Leo, each wearing chlamys; cross between. 757-775 (Constantinople). SB 1565, DOC II 15 AU Solidus Obv: CONTANLEON - Facing bust of Constantine V on left and Leo IV on right, each wearing crown and chlamys; in field above, cross. Rev: dNLEOPAM - Facing bust of Leo III, wearing crown and loros and holding cross potent. c.751-755 (Syracuse). SB 1570, DOC II 35 AU Solidus Obv: DNOCONTANTIN - Crowned facing bust of Constatine V, holding globus cruciger and akakia. Rev: DNOLEAMUL - Crowned facing bust of Leo III, holding globus cruciger and akakia; in field, I and E. [This specimen struck from electrum or other debased gold alloy]. 751-755 (Rome). $3,000 9/25/02. 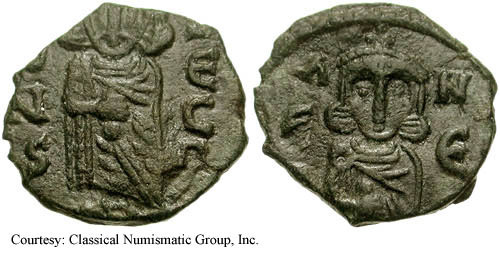 NAC 29 #709 AU Solidus Obv: dNCONTANTIN - Crowned facing bust of Constantine V, wearing chlamys, holding globus cruciger. Rev: dNOLEONPAMUL - Crowned facing bust of Constantine V, wearing chlamys, holding globus cruciger. c.741-742 (Syracuse). SB 1553 AU Semissis Obv: Constantine V and Leo IV crowned facing bust; cross above and between them. Rev: Leo III crowned facing bust, holding cross potent and globe. 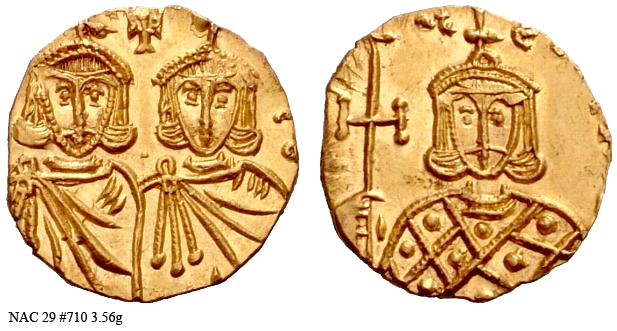 751-757 (Constantinople). SB 1567, DOC III 17 AU Tremissis Obv: Crowned bust facing, holding cross on globe. Rev: Leo IV crowned bust facing, holding cross potent. (Syracuse). $400 5/19/2004. SB 1579, Berman 4 AR Eighth of Siliqua Obv: Crowned beardless facing bust, wearing chlamys; cross in left field. Rev: Rm monogram; Z (Zacharias) in upper left field. [This class was unknown before 1985 and is of considerable interest. Its existence shows that the silver coins at present listed in the various standard works under Constantine V for Rome, those with the reverse type K combined with a cross and emperor wearing a loros, must be re-attributed to Pope Constantine. Zacharias is also known to have issued square bronze tessere, cf. Berman pg. 31, 5. Pope (and St.) Zacharias is noteworthy in history for his momentous decision to bless St. Boniface's anointment of Pepin the Short as king of the Franks. In 751, Zacharias appealed for the Franks' help against Aistulf, who had taken Ravenna and was demanding suzerainty over Rome as part of his enlarged dominion of the Lombards. CNG]. 741-752 (Rome). $2,000 5/22/02. SB 1568, DOC II 18 Follis Obv: KWNS О” CО - Constantine V standing, facing, holding akakia. Rev: О›E N - Leo IV standing, facing, holding akakia. 751-775 (Syracuse). SB 1569, DOC II 19 AE Follis Obv: Crowned facing busts of Constantine V and Leo IV, cross in between. Rev: Leo III crowned facing bust, holding cross potent. 751-775 (Syracuse).